Dress up her hair with these monogrammed ponytail holders available on either a elastic ponytail holder or choose a locking pin back and attach them to the center of any flat knot pony streamer,Flip Flops or boutique hair bow. You'll find plenty of different ways to customize your ponytail without the custom prices. A Initialed button ponytail holder in your choice of striped ribbon and thread colors. A wonderful way to jazz up a school uniform and a great alternative for older girls too. Sparkle's on ponytail holder are always a fun and wonderful way to jazz up a outfit. Plus older girls love them too. "JUST LIKE BEING ON VACATION" These are so cute and fun ! Change the look of any hair bow or streamer with a flat knot center. A wonderful way to jazz up the school uniform hair bow ,back packs, flip flops, ponytail streamers. PIN THEM TO JUST ABOUT ANYTHING ! A wonderfull way to spice up that special Ballet outfit! The Pony O is the new rage. A wonderful way to jazz up the school uniform and a great alternative for older girls too. Choose a Thread color to match up her shirt , throw on a pair of jeans and you have the perfect look from head to toe. Dont forget to take a look at our FLIP FLOP BOWS TOO! Makes a great alternative for older girls and moms alike. The Pony-O is all the new rage. A wonderful way to jazz up the school uniform and a great alternative for older girls too. Choose from any of our soild grosgrain ribbon. Makes a great alternative for older girls and moms alike. A O'Sew Pretty original and wonderful little accent piece you can design to match her outfit. 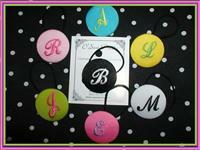 A classically Monogrammed button ponytail holder that you design to coordinate with her special outfit. A ponytail holder made from Leopard print ribbon, and monogrammed with child first initail. A ponytail holder made from dalmation print ribbon, and monogrammed with child first initail. Now you can perk up those dull old keys with this personalized key chain. Attached them cheer bags, and luggage. Makes a great present for teachers, brides maids, moms or make them to match school colors for tweens and teens. Choose her age, or team number and favorite color and make it to match her birthday outfit or team uniform. Select the pin back style and pin it to the center of a hair bow, headband or ponytail streamers ! The Pony-O is all the new rage. A wonderful way to jazz up her princess attire. The Pony O is all the new rage. A wonderful way to jazz up that soccer uniform and a great alternative for older girls too. This monogrammed beauty is available in your choice of either a one, two or three letter monogram in countless colors. Monogrammed button ponytail holder's are available in either a 2 or 3 letter monogram and your choice of countless button and thread color combinations.